Please refer to our stock # 3505 when inquiring. This unusually shaped carved bone snuff bottle is a late Meiji period (1867~1911) product. It is 2 3/4” long, 1 ¼” wide and ¾” thick. 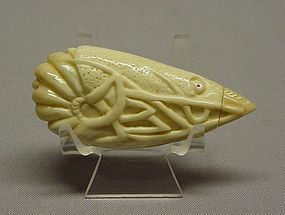 It depicts a curled shrimp as the body of snuff bottle. The bamboo spoon is a replacement. It has a great patina and is in great condition.